Welcome to the April 2009 edition of ACE NorCal News! The ACE NorCal Santa Cruz Beach Boardwalk Behind-the-Scenes Tour II was a huge success. Eighty-one members and guests attended. Many were local, some came up from SoCal, still others came from as far away Pennsylvania, New Jersey, and Argentina! Watch for the full story in the next issue of ACE News. Bill Theobald, NorCal ACE member from Berkeley has posted his pictures from the event. To see them, please visit: Bill Theobald’s SCBB Tour Event photo album. Has anyone else posted their photos? Send the link our way, and we’ll gladly share it with ACE NorCal, OK? Ah! It is so nice to think back to our wonderful weekend at the Santa Cruz Beach Boardwalk. Thanks for sharing my photos with ACE NorCal. Enjoy! Thanks again for putting on a great event, Darren. Thank you once again for letting my niece and nephew come along with me. It was a great weekend for all of us. It was great to do something so fun on their last weekend before heading back home. This was the first time for both of them at the Boardwalk, so it was also obviously their first time on the Giant Dipper also. They loved it! They are now safe and sound back in Argentina. The mileage on the name tags was priceless. They really appreciated the extra effort. I gave Colleen and Tom their name tags when we got back and they thought it was hilarious. Looking forward to 2014. Everyone here really had fun working with your event. We love our park, and always enjoy sharing it with an appreciative audience! Are you sure you want to wait until 2014 to do it again? Thanks again so much for your hospitality and the great time in NorCal. I’ll keep my eyes open for another one of your events. Your group was so very helpful. Please pass along my thanks to everyone! As anyone knows who has talked with me about my love for amusement parks and attractions, the Santa Cruz Beach Boardwalk is my favorite amusement park in the world, and contains my favorite roller coaster, the Giant Dipper. So to say this event was, for me, a highlight of my life, is an understatement! I am very grateful for both this event and the one 5 years ago–thanks for helping me experience things I’d never normally be able to when I visit the Boardwalk. Thank you and everyone involved for all the hard work that went into it, and, if the event is possible in 2014 I offer my help in organizing and executing the event! Again, thank you all, I had a terrific time! Just wanted to say thanks to you and the folks at ACE and SCBB for putting together a great event over the weekend. The social and mini-golf tourney were great touches too. It was great to meet you, and I really look forward to the next event! Wow, thanks for all the great e-mails everyone! I really appreciate it. Producing the event was my esteem and great pleasure. Thanks much to the entire staff at the Santa Cruz Seaside Company, for without their cooperation & enthusiasm, this event would not have been possible. 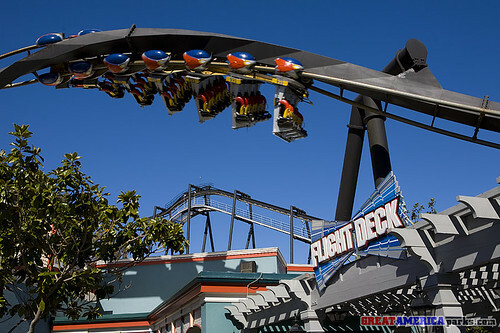 California’s Great America has opened for the 2009 season! And for Spring Break, the park will be open daily from April 10th through the 19th. For details, check out the park’s operating calendar. For details on these events, see the park’s events page. For more information about California’s Great America, visit the park’s web site. Gilroy Gardens opens for the 2009 Season on Saturday, April 4th. It’s hard to believe, but this will be the park’s ninth season already! For Spring Break, Gilroy Gardens will be open daily from April 10th through the 19th. For more details, see the park’s operating calendar. With Gilroy Gardens under Cedar Fair management, you have a variety of options when it comes to enjoying Gilroy Gardens on a season pass. If you buy season passes from California’s Great America (CGA), admission to Gilroy Gardens is included on both Gold and Platinum season passes. Neither of these CGA passes include parking at Gilroy Gardens. If you buy a Gilroy Gardens membership, you enjoy a full season of admission to the park as well as special benefits at Gilroy Gardens not included on the CGA season passes. In addition, Gilroy Gardens memberships are fully tax deductible! For more information about Gilroy Gardens memberships, go to Gilroy Gardens tickets page . For more information, visit Gilroy Gardens web site. Spring Break is the main focus for SFDK in April, with operating hours every day from April 3rd through April 19th. After the 19th hours return to Friday, Saturday and Sunday only. Animal shows and exhibits are touted as new for 2009, with more interactive experiences than ever. “Odin’s Temple of the Tiger,” the new venue for the park’s lively and water-loving tigers, opens later this Spring. “Coaster Alley” should be in full swing as well, including favorites like ROAR! and Medusa. Remember the park has eight coasters total, so rack up those ride totals (although if you’re a grown-up you may have to ask someone a wee bit younger to help you do so on a couple of them!). The park’s summer concert series has been announced. Click on the park’s website at the end of this update for details. Currently 2009 Season Passes are on sale for $49.99, only $5.00 more than a one-day admission ticket! You can buy and print them on the park’s website. And, a fun promotion to end this update: pay just $6.00 admission on April 3rd if you dress like Six Flags’ “Mr. Six,” the company’s popular, bespectacled fun-loving senior citizen.